You got to know when to hold ‘em and know when to fold ‘em...and here is one that is on everyone’s list! Without question, our Texas Hold’ em bull is the stoutest, deepest, soundest, and hairiest Mossy Oak son we have ever seen. 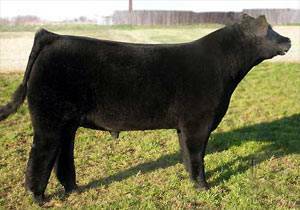 He was the top selling bull in the 2004 Cowtown Classic sale in Wahoo, Nebraska. When in need of a “pretty” one, Texas Hold ‘em will deal you a winning hand every time.